Our projects and collaborations with communities around the world are made possible thanks to our network of pioneering funders and partner organisations. We are indebted to the following organisations who have worked with us and supported our vision over the last sixteen years. By reframing the way the world views farmers, facilitating collective learning and catalyzing innovation through farmer-to-farmer exchange, and supporting on-the-ground efforts for farmer-led research and documentation, A Growing Culture work to protect smallholder farmers’ natural right to define and shape their own food system. InsightShare is working with AGC to support the Library for Food Sovereignty (LFS), a community-led resource for sharing, and safeguarding farmer innovations from around the world. For more information visit A Growing Culture website. Artists Project Earth aims to create a better world by bringing the power of music and the arts to 21st century challenges. APE grants have supported our work with indigenous filmmakers in Panama, Peru, Kenya and Philippines; notably a series of videos on the rights of Mother Earth. For more information visit the Artists Project Earth website. The Asia Pacific Indigenous Youth Network is a coalition of young people and organisations from the Asia-Pacific region. APIYN and InsightShare have collaborated on several training programmes – for indigenous communities in the Philippines and indigenous activists from across the Asia-Pacific region – since 2009. For more information visit the APIYN website. Okani (meaning ‘rise up!’) is a Baka-run organisation in Cameroon, concerned with promoting the rights of Baka people and other Pygmy communities across the Congo Basin. We began working with Association Okani in 2009, with the introduction of Participatory Video which they are using to monitor conservation projects and the impact of palm oil plantations. For more information visit the Association Okani website. BRAC is an international NGO that operates in 11 countries particularly looking at addressing poverty and supporting people’s livelihoods. BRAC Uganda was part of the pioneering Video Girls for Change programme we set in place alongside Nike Foundation to support adolescent girls evaluate girl-centred programming in 2011/12. For more information visit the BRAC website. The British Council is the UK’s international organisation for cultural relations and educational opportunities. InsightShare has supported British Council to evaluate their ‘ESOL Nexus’, ‘Active Citizens’ and ‘English My Way’ programmes. For more information visit the British Council website. CAFOD is an international development charity and the official aid agency of the Catholic Church in England and Wales. We worked with CAFOD on a capacity-building programme for one of their local partners in Sierra Leone, during 2007/8. For more information visit the CAFOD website. Christian Aid provides urgent, practical and effective assistance where need is great, tackling the effects of poverty as well as its root causes. InsightShare and Christian Aid worked together on a Participatory Video project in Angola in 2012, funded by Comic Relief. For more information visit the Christian Aid website. The Church of Sweden is part of the global fellowship of churches, with close relationships to other churches around the world. As one of the churches and organisations in the ACT International network, they play an active role in disaster relief. Church of Sweden has funded InsightShare’s capacity-building programmes in Myanmar and Liberia as well as a short Participatory Video process in Malawi, working with human rights defenders to explore the shrinking space for civil society in East Africa. For more information visit the Church of Sweden website. Comic Relief is a major charity based in the UK, with a vision of a just world, free from poverty. Comic Relief funded a series of six InsightShare projects with farming communities on the frontline of climate change in Africa, implemented in 2012. For more information visit the Comic Relief website. The Centre for Agroecology, Water and Resilience (CAWR) at Coventry University is driving innovative, transdisciplinary research on the understanding and development of resilient food and water systems internationally. We provide CAWR’s research team an ongoing training and support programme to integrate Participatory Video into their action research. For more information visit the Coventry University website. The d.school Paris was established through a collaboration of five different universities. Its aim is to inspire a different kind of educational approach, developing a new generation of training programs in breakthrough innovation drawing on design thinking methods, such as those established at Stanford University (USA). In 2016 they awarded Chris Lunch (Co-Founder and Director, InsightShare) with a Fellowship, and we have been working together ever since on evolving new methodologies for social innovation and for harnessing collective intelligence. For more information visit the d.school Paris website. Fairtrade is a global movement with a strong and active presence in the UK, represented by the Fairtrade Foundation. InsightShare and Fairtrade Foundation worked together on a Participatory Video project in Côte d’Ivoire in 2012, funded by Comic Relief. For more information visit the Fairtrade Foundation website. Girl Effect, initiated by Nike Foundation, has been at the forefront of girl empowerment. We have supported two of their partners to incorporate Participatory Video and Most Significant Change into their Monitoring and Evaluation (M&E) strategies. Our groundbreaking capacity-building programme in Guatemala and Uganda – called Video Girls For Change – enabled groups of girls to evaluate girl-centred programming and proposed their own recommendations. For more information visit the Girl Effect website. IIED is a policy and action research organisation, promoting sustainable development to improve livelihoods and protect the environments on which these livelihoods are built. IIED has commissioned InsightShare to work on several initiatives over many years; from pioneering community-level monitoring of climate change adaptation strategies, to writing articles, and training staff in participatory communications for development. For more information visit the IIED website. The International Livestock Research Institute (ILRI) works to improve food security and reduce poverty in developing countries through research for better and more sustainable use of livestock. We worked with ILRI on a project to engage farmers in the Amhara region of Ethiopia, in 2012, as part of the Nile Basin Development Challenge, funded by the CGIAR Challenge Program for Water and Food. For more information visit the ILRI website. IRC is an international humanitarian organization at the forefront of natural disaster and man-made conflict response. InsightShare supported IRC to incorporate Participatory Video into their gender-based violence prevention programming in refugee camps across Ethiopia. For more information visit the IRC website. IUCN provides public, private and non-governmental organisations with the knowledge and tools that enable human progress, economic development and nature conservation to take place together. In 2013, InsightShare undertook capacity-building programmes for IUCN Netherland’s partner organisations in Bolivia and India. For more information visit the IUCN website. Kivulini Trust work with pastorialist and hunter-gatherer groups in remote areas of Northern Kenya. 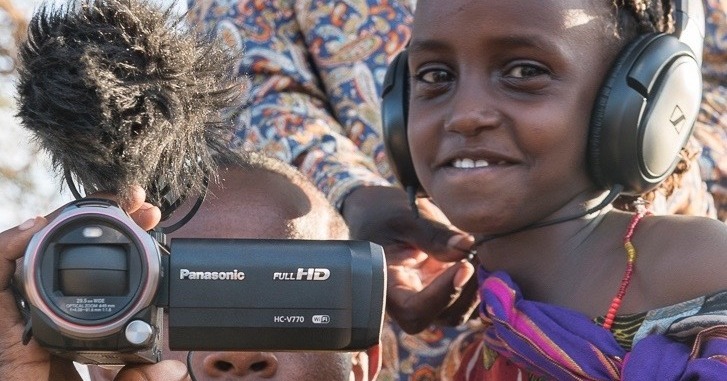 With support from The Christensen Fund, InsightShare and Kivulini Trust are strengthening the capacity of Gabra, El-Molo and Borana communities to use Participatory Video to document, learn and share their experiences and challenges. For more information visit the Kivulini Trust website. Land is Life is a network of indigenous leaders, communities and organisations addressing grassroots challenges and opportunities while upholding Indigenous Peoples right to self-determination. Land is Life, InsightShare, and Nicolas Villaume co-founded the acclaimed Conversations With the Earth multimedia programme and museum exhibition in 2009. For more information visit the Land is Life website. The Lorna Young Foundation helps smallholder producer organisations in developing countries to make the transition from being simply growers of raw crops to being in control of their own businesses. InsightShare and Lorna Young Foundation worked together on a Participatory Video project in Kenya in 2012, funded by Comic Relief. For more information visit the Lorna Young Foundation website. LWF Myanmar program responds to human suffering and challenges its causes, contributing to the alleviation of poverty in Myanmar through rights-based empowerment for sustainable development. InsightShare undertook a capacity-building programme for LWF Myanmar and its programme beneficiaries in Myanmar during 2013. For more information visit the LWF Myanmar website. Mainyoito Pastoralists Integrated Development Organization (MPIDO) is a Kenyan NGO working towards a just and equitable society that recognises and upholds human rights and the fundamental freedom of Indigenous Peoples. InsightShare and MPIDO partnered on a Participatory Video project with Maasai communities in the Rift Valley, during 2009, as part of the Conversations With the Earth programme. For more information visit the MPIDO website. The MDG-Fund was established by the government of Spain to help accelerate the achievement of Millennium Development Goals by 2015. We supported the UN team in the Phillippines to run a Participatory Video Evaluation in Mindanao; listening to farmers, high school students, community members and local policy makers. For more information visit the MDG Achievement Fund website. Mercy Corps are experts in humanitarian and conflict response, connecting people to the resources they need to build better, stronger lives. InsightShare supported Mercy Corps in 2010 and 2013 to evaluate their work in Kenya, looking at the impact of their sports for change and financial literacy projects that were part of their LEAP programme. For more information visit the Mercy Corps website. Award-winning photographer, Nicolas Villaume is a specialist in social and portrait photography in demanding environments. Nicolas was a founding partner in the Conversations With the Earth multimedia programme and museum exhibition, in 2009, alongside InsightShare and Land is Life. For more information visit Nicolas’ website. Nike, Inc. is an American multinational corporation that is engaged in the design, development, manufacturing, and worldwide marketing and sales of footwear, apparel, equipment, accessories, and services. In 2007, InsightShare received funding from the Corporate Social Responsibility programme at Nike Inc. to support young people in Namibia, Morocco, Rwanda and the UK tell their stories through Participatory Video. For more information visit the Nike website. North East Network (NEN) is one of the first organisations in the North East of India to combine activism with advocacy from a liberal feminist perspective, conveying critical gender issues through dialogue and dissemination. InsightShare has worked with NEN since 2015, training community members and staff as participatory filmmakers and facilitators; helping to support an emerging community media hub in the region. NEN is currently a partner of the InsightShare Network. For more information visit the North East Network website. NESFAS brings together partners from different sectors that can help in the enhancement of agrobiodiversity, leading to food sovereignty. InsightShare received funding from NESFAS and the Indigenous Partnership for Agrobiodiversity and Food Sovereignty in 2015/16, through which we trained 10 young people from Garo, Khasi and Naga communities as community filmmakers; linking indigenous peoples and local communities in North East India. For more information visit the NESFAS website. Open Cinema is a nationwide network of film clubs programmed by and for excluded or marginalised people. InsightShare partnered with Open Cinema to undertake a groundbreaking webinar series Better PV Practice, together with the Open University. For more information visit the Open Cinema website. Oxfam is a globally renowned aid and development charity with 70 years of experience, working and campaigning with partners in over 90 countries worldwide. InsightShare has worked with Oxfam on several projects including a capacity-building programme for partners working on gender-based violence in Southern Africa, and access to healthcare services in Nepal. For more information visit the Oxfam website. Population Council conducts research and delivers programmes around the world based on evidence. We worked with their team in Guatemala, supporting them to include Participatory Video and Most Significant Change into their Monitoring and Evaluation (M&E) system, so adolescent girls could evaluate their Abriendo Oportunidades programme during 2011/12. For more information visit the Population Council website. Practical Action is an international non-governmental organisation (NGO) that uses technology to challenge poverty in developing countries. InsightShare has delivered staff training and workshops in Participatory Video for Practical Action in Peru and Sri Lanka. For more information visit the Practical Action website. The Christensen Fund believes in the power of biological and cultural diversity to sustain and enrich a world faced with great change and uncertainty. TCF has given grants annually to InsightShare and our local partners, since 2009, in support of our growing network of indigenous community media hubs. For more information visit The Christensen Fund website. The Gaia Foundation works with local and indigenous communities, civil society groups and social movements to restore a respectful relationship with the Earth. InsightShare and The Gaia Foundation worked together on a Participatory Video project in South Africa in 2012, funded by Comic Relief. For more information visit The Gaia Foundation website. Formerly MLURI, this globally recognised research organisation specialises in sustainable use of land and natural resources. InsightShare collaborated with The James Hutton Institute on a number of EU funded multi-disciplinary research projects. In one project we carried out community consultation processes across 3 countries in the Karakoram-Hindu Kush-Himalayan (KHKH) region to identify local perspectives and recommendations for sustainable integrated mountain development policies. For more information visit The James Hutton Institute website. The Lia Fund, a private foundation, has now closed its doors after six years of making grants to social-change organisations that promoted a holistic view of the world, informed by the wisdom of Nature. The Lia Fund supported our work with indigenous filmmakers in Panama, Peru, Kenya and Philippines; notably a series of videos on The Rights of Mother Earth. For more information visit The Lia Fund website. The Open University (OU) is a public distance learning and research university, and one of the biggest universities in the UK for undergraduate education. InsightShare and The Open University were co-grantees and partners in the groundbreaking webinar series Better PV Practice, together with Open Cinema, in 2014/15. For more information visit the Open University website. Youth Business International is an international network leading on youth entrepreneurship around the world. InsightShare conducted an introductory workshop for YBI at the World Summit in 2013, and Soledad Muñiz (Head of PV M&E, InsightShare) sat on YBI’s Research and Policy Advisory Group from 2015-16. For more information visit the Youth Business International website. The Staples Trust is one of 17 nonprofits that operate as separate legal entities under the Sainsbury Family Charitable Trusts umbrella. Based in the United Kingdom, Staples focuses human rights grantmaking on gender issues, rights of indigenous people, and the defense of human rights and civil liberties. The Staples Trust provided InsightShare with core funding over several years, enabling us to pioneer a grassroots indigenous community media network. For more information visit The Staples Trust website. From villages in rural India to the corridors of power in Brussels, Transparency International gives voice to the victims and witnesses of corruption. InsightShare and Transparency International have undertaken several projects together since 2010, including a groundbreaking series of Participatory Video projects exploring the intersection between land and corruption in Africa. For more information visit the Transparency International website. Twin is a development through trade NGO working with 43 producer organisations representing over 300,000 coffee, cocoa and nut smallholders in 17 countries across Latin America, Africa and Asia. InsightShare and Twin worked together on two Participatory Video projects in Malawi and Uganda in 2012, funded by Comic Relief. For more information visit the Twin website. UN Women is the global champion for gender equality, working to develop and uphold standards and create an environment in which every woman and girl can exercise her human rights and live up to her full potential. In 2014, UN Women commissioned InsightShare and Impact Ready to conduct a Participatory Video evaluation in Moldova as part of their corporate global evaluation into women’s economic empowerment. For more information visit the UN Women website. The United Nations Children’s Fund is a United Nations (UN) programme headquartered in New York City that provides humanitarian and developmental assistance to children and mothers in developing countries. InsightShare and UNICEF are partners on projects in Cote d’Ivoire, Sierra Leone, Uganda, Burundi and The Philippines. We have conducted evaluations of their peacebuilding work and trained young people to share their experiences of conflict. For more information visit the UNICEF website. The UN Association of Finland is a Non-Governmental Organisation that promotes and supports the actions and principles of the United Nations. InsightShare has worked with UNA Finland since 2013 on a range of projects and workshops with different groups from across East Africa. For more information visit the UNA Finland website. The United Nations Development Programme (UNDP) is the United Nations’ global development network. Headquartered in New York City, UNDP advocates for change and connects countries to knowledge, experience and resources to help people build a better life. The UNDP Small Grants Programme helped to fund two of our most important guidebooks (Participatory Video handbook and Rights-Based Approach toolkit), and several Participatory Video projects with indigenous communities around the world. For more information visit the UNDP website. The University of East Anglia (UEA) is an internationally renowned university based in a campus that provides top quality academic, social and cultural facilities to over 15,000 students. The School of International Development at the University of East Anglia undertook groundbreaking research on environmental justice during 2014/2016. InsightShare trained their senior researchers and national counterparts in Tanzania, Bolivia and China to incorporate Participatory Video as a research methodology. For more information visit the UEA website. The Video4Change network (V4C) is a group of organisations using video to affect social change. The network is membership based and was founded at an event in June 2012 in Indonesia. InsightShare is a founder members of the Video4Change network and collaborates with the network partners on a range of initiatives. For more information visit the Video4Change website. The Walcot Foundation is an independent grant-making foundation and charity working to break cycles of financial deprivation for people living in Lambeth. The Walcot Foundation provided funding to InsightShare to train young people in Lambeth as ‘video coaches’, supporting other young people to harness Participatory Video. For more information visit the Walcot Foundation website. War Child is an independent and impartial, international nongovernmental organisation investing in a peaceful future for children and young people affected by armed conflict. In 2012 InsightShare undertook an evaluation of War Child Holland’s work in South Sudan using community video for intergenerational dialogue. For more information visit the War Child website. Well Grounded provides organisation development support to civil society organisations in Africa so they have real and sustainable impacts on natural resource governance and community rights. InsightShare has worked with Well Grounded on two projects in the Democratic Republic of Congo focussed on indigenous rights and peaceful cohabitation between indigenous and non-indigenous communities. For more information visit the Well Grounded website. Women for Refugee Women is an organisation that challenges injustices experienced by women who seek asylum in the UK. InsightShare worked with members of their London Refugee Women’s Forum, creating opportunities for women to speak out about their experiences as refugees in the Britain. Their powerful advocacy video was shown to policy-makers and key public events. For more information visit the Women for Refugee Women website.